Do you know why we take pictures? Because being in a special situation or special time zone you feel the ultimate joy be it in the company of nature, family, and friends or of your own self. So the picture taken at that special happy time keeps you reminding those fun and joyful moments together and even work as mood delighters when you are sad or anxious. And the best way to feel the positive and happy vibes of those happy and memorable times is to display the pictures at certain spots where every eye can look at them. And for this purpose, you need a cute and gorgeous picture frame that now you can make of your own with a more custom and personalized touch. 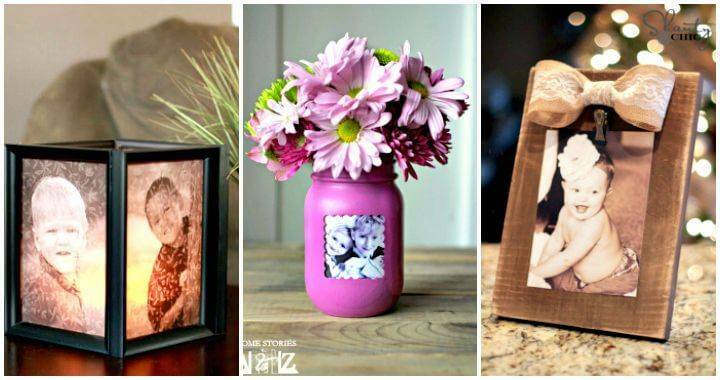 So check out these stunning 20 DIY picture frame ideas to frame up you’re your best-captured picture in. When there is a DIY project to do you at home there is like endless possibilities for the creativity and personalized to manifest in that project. You can use anything that you think can act like a frame and hold the pictures nice and firmly in it. Here in the following given ideas you would lot of fun and functional ways to frame your pictures in the best beautiful way and display them on your walls, tables, shelves or mantles. Whenever you would pass by these pictures or happen to have an eye on them you would surely go on a roller coaster ride of the memories. For a rustic and natural appealing DIY Picture frame you can use the free found pallet wood, cut it into slats and then stack the pieces together to form a frame like the structure of desired size and shape. For a simple yet cute idea, you can simply dress up the existing frames with washi tape, maps, old books and magazine paper. Those who are looking for the smart and unique one ideas should really follow the brag book, mason jar and the photo luminaries projects to satisfy their creative urge. All the easy craft ideas are loaded with the tutorial details, guidance and stepwise instructions and to approach them you need to click on the links below each picture.